Apple has sought to improve the experience of shopping at its iconic retail stores in recent times with the introduction of the Apple Store app, and today, that very feature has been offered a handsome update. Apple Store version 2.7, which has just been made available over at the iOS App Store, offers the usual array of bug fixes and performance enhancements; notably better search functionality. 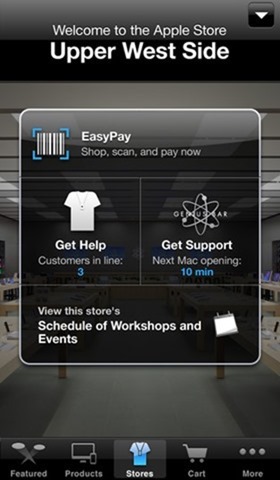 Whenever you make a purchase at an Apple Retail Store nowadays, you’re invariably encouraged to fire up the Apple Store app to make your payments, and although it does feel a bit gimmicky and ever so slightly pretentious, it’s actually a very sensible way to pay up and keep your receipt in one fell swoop. Moreover, the app is perfect for making a new purchase of an iPhone, iMac or iPad on-the-fly, and with these latest tweaks and touch-ups, things are now even easier than ever. It’s the perfect hub of information about everything relating to Apple’s product range, and while we’ve all grown used to retail store staffers plugging the app for payments, it wouldn’t surprise me if Apple added the feature as a stock offering in the near future. 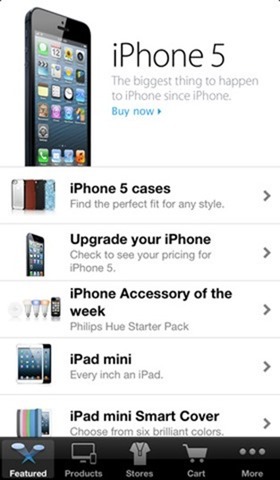 Following up to a previous report, it has also reported recently that employees may be encouraged to install the Apple Store app on just-purchased iPhones as part of a new initiative, so if there is a future plan to bring the Apple Store app to the native list, it would seem the Cupertino is already laying the necessary foundations. The idea of installing the app would be sold to consumers with promises of new, possibly free content from the various iTunes and iBooks Stores. Said content would likely only be available for a limited time, but would help new users get to grips with downloading content to their shiny new devices. Although it’s uncertain whether this feature has been added to the latest version, we’ll be keeping an eye out for such a feature to kick in. Anyhow, the new Apple Store app is now ready to download, and as ever, doesn’t cost a cent.